What Day Of The Week Was August 10, 2003? 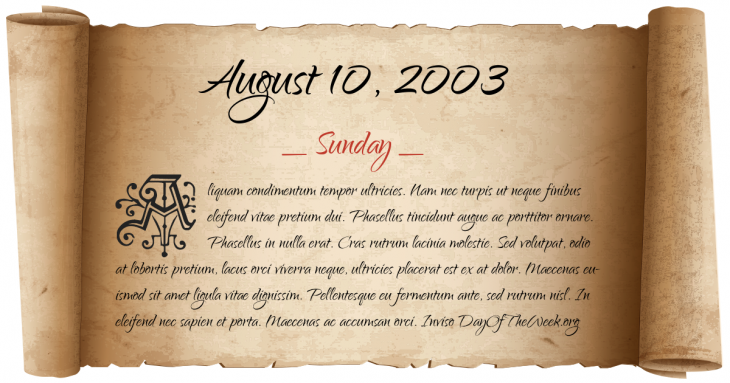 August 10, 2003 was the 222nd day of the year 2003 in the Gregorian calendar. There were 143 days remaining until the end of the year. The day of the week was Sunday. A person born on this day will be 15 years old today. If that same person saved a dollar every day starting at age 4, then by now that person has accumulated $4,272.00 today. The highest temperature ever recorded in the United Kingdom – 38.5 °C in Kent. It is the first time the United Kingdom has recorded a temperature over 100 °F. Yuri Malenchenko becomes the first person to marry in space.